As you walk down the grocery aisle and examine the many varieties of toothpaste and other oral care products, it can make oral care so much more complicated than it needs to be. Maintaining oral health didn’t used to be so complicated, according to a dentist in Weyauwega. The fact of the matter is you don’t need to worry about purchasing the most advanced toothbrush or using whitening products to get the best looking smile. All that matters is that you follow these key oral care steps. Doing so will more than likely ensure that you maintain good oral health for life. When you think about it, an overwhelming majority of the oral care you need to perform does not even occur in a dental office. If you’re practicing regular brushing twice a day and using fluoridated toothpaste, you should only be spending two days out of the year in a dental practice. 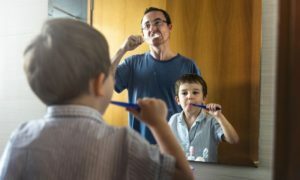 Since you won’t have a dentist living in your home and cleaning your mouth for you, it is crucial that you establish a routine and technique that is effective in between your visits. When brushing, make sure to brush for at least two minutes at a time. Don’t brush for much longer than that as it’s unnecessary and can actually damage your enamel in the process. Only use a toothbrush with soft bristles as harder versions can wear away enamel. Brush all the surfaces of your teeth and clean along the gum line to reduce the risk of gum disease. If you weren’t told to floss daily by your parents, then it can be understandably difficult to start flossing. However, that doesn’t make it any less important for your oral health. In fact, brushing only removes about 60 percent of plaque from your mouth at a time. That means the remaining 40 percent of plaque is sitting on the sides of your teeth and just begging to be flossed away. If you struggle to floss, consider purchasing floss picks that provide a handle for easier movement. If you want to reduce your use of plastic, consider purchasing a floss holder to wrap your floss around. Of course, no oral care regimen is complete without visiting the dentist twice a year for checkups and cleanings. Checkups help you confirm if your current at-home care is working. They also help you determine if any decay or gum disease is present. If you skip visits, then you run the risk of developing dental disease later that requires extensive and expensive treatment to fix. Since there are many hard-to-reach areas of the mouth where tartar (the calcified form of plaque) can hide, you’ll need a professional’s trained eye and tools to remove it. The last thing you want to do is try to remove tartar yourself as this could result in the permanent damage of your enamel. Maintaining oral care isn’t hard when you know the fundamentals. Make sure your next appointment with a holistic dentist in Weyauwega is scheduled! Dr. William J. Twohig’s office offers everything you could ever need to practice holistic dentistry at home. This includes natural hygiene products and oils that keep your teeth and gums clean. Of course, he also offers all the services you’ve come to expect in dentistry, except with a holistic philosophy in mind. To learn more about his practice, you can contact him through his website.